I have known Carol Harrison for over eight years through Toastmasters and have admired her ability to give warm presentations on a variety of subjects. Being a Toastmaster, I have been fortunate to witness Carols numerous presentations from club level to area level to division and on to district. Carol has also earned the respect of international presenters like Anne Barab and Sheryl Roush. On enquiring about Carol's method to successful presentations, Carol informed me that it is due to her storytelling skills. However, I am in the technical field and asked if this would be still relevant to me. Carol's response was a most definite, 'YES' and then presented a workshop on the importance of storytelling in technical presentations. This presentation required some research by the participants and was a revelation to me. I used the lesson in my last presentation that I presented to my company and received numerous compliments on the presentation. Thank-you Carol. I just wanted to say it was a pleasure attending your seminar and that I left feeling more confident about public speaking. I received a few great tips from both of you and I plan on using them going forward. I will definitely be recommending you for any businesses that may be asking for references regarding these subjects. Thanks so much and I hope to meet again in the future. "On behalf of the students and staff at Marion Graham Collegiate we wish to extend our sincere gratitude to you for your contribution to our recent wordfest: a celebration of literary arts. Your session, Speaking for Success has received very positive reviews from students and staff alike. I would like to take this opportunity to thank you for your continuing participation in the speech crafter session that were given in January 2010 to the first year students in the biotechnology and veterinary technology programs at SIAST Kelsey Campus. I marvel at your patience and good humour while working with these young people. It is truly remarkable to watch you weave your magic in helping transform the most timid and terrified students into more confident speakers. I commend you for your commitment to your craft and thank you for your long service as coordinator of these sessions." "Carol we want to thank you for your whole hearted effort and willingness to sere us with your gift of speaking." 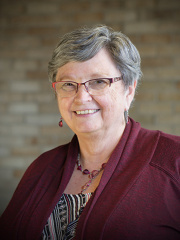 "I am the senior pastor at Pleasant Hill Mennonite Church in Saskatoon, Saskatchewan where Carol is a member. Over the past few years she has taught our ladies bible study and served our church as Adult Education Coordinator. You will be so blessed to hear her share of the things God has taught her in life. If you have further questions please feel free to contact me at 306-382-6585 or at officephmc@sasktel.net"
"I've known Carol for about ten years or so. Initially, I met Carol and her family as parishioners in the church where my husband is a pastor. Our valued relationship as friends, however, really began when she was a participant in a Depression Support Group that I facilitated. These days, we engage in conversation quite often even though they now worship in another Christ-honoring congregation. The following are some of the traits taht I have observed in Carol over the years : 1) Integrity - Carol strives to live out what she believes and works hard to have her words and actions match each other. - She holds peeople of all ages and abilities in high respect and treats them with dignity. - I believe Carol is a deeply honest person. 2) People Skills - Carol is friendly and cares for those she serves. She smiles with her whole being. - She has been gifted to teach. Carol communicates well and draws especially from her personal, everyday experiences. - I find her ability to connect intriguing. Because she's had many challenging life experiences, she reads people well and can touch them where they're at. - Carol, I believe, is committed to team work and unity. 3) Strong attitude towards life learning - Carol is rarely without some intentional research project concerning another interesting topic. She's a keen life-long learner. - She is willing to tackle topics other may well shy away from; i.e what special needs people can teach us. 4)Spiritual Maturity - Carol draws strength for herself through a close relationship with Jesus Christ. - She is commited to the habits that make for a strong Christian life and influence. - Her spirituality is radiant and contagious. Throughout the years I have had the privilege of sharing a friendship with Carol. I've known her to be faithful and caring. I highly recommend her for ministry to you and your organization. If you have further questions contact me at 306-242-1927 or dibarkman@sasktel.net"
"It was truly a pleasure to have Carol speak to the 8-10 year olds at Island Lake Bible Camp from July 4-9, 2010. In the week I worked with her, you could see that she is a very loving, kind and compassionate person who is filled with the joy of the Lord. She effectively and happily shared Jesus thru true life stories and object lessons. Carol was very organized and the kids loved their treasure bags and all their treasures that she gave them. She was very age appropriate and loved sharing the gospel. Carol had excellent rapport with the kids, councelors and all the staff and we appreciated her interaction with everyone at camp. Her cheerful disposition was such a benefit becasue of the positive infulence it had on the camp. We are very thankful for and appreciate Carol's attitude of obedience to her Lord and Savior as she was a part of ILBC! I consider it an honor to now call her friend! Thanks again Carol! I look forward to working with you again!" "Thank you for sharing what God put on your heart with us. We really appreciate you so much. Thank you for serving The Lord in this way. We were truly blessed." "Thanks so much for sharing your heart testimony from your life. It was a pleasure getting to know you & I think the ladies have a better understanding of the goodness of our gracious Heavenly Father." "It was such a joy to have you with us. What a gift." "Thank you so much for coming out tonight and serving us. It indeed was such a blessing." "Very good, Very encouraging book. You have gone through alot." My neighbour just finished Amee's Story in tears. It touched her. I read it ( Amee's Story_ and it's fabulous! It really was so poignant and heart warming. I applaud your devotion, courage and faith. You're a inspiration! Keep the passion you have for communicating both in speaking and now writing! "I do have to admit that in reading the story, I was taken on an emotional roller coaster ranging from tears to broad smiles. I wish to thank you for taking the time and energy to recall this amazing story in such a compelling manner." "I read it ( Amee's Story) and it's fabulous! It really was so poignant and heart warming. I appaud your devotion, courage and faith. You're an inspiration!" Aviva Engel- editor of Exceptional Family magazine. 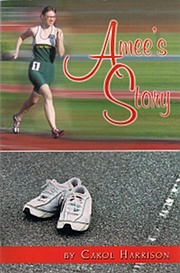 "Thank you Carol for sharing Amee's Story, her struggles were many but she is fearfully and wonderfully made. Pray that it would have an encouraging impact and show the faithfulness of God to those who read this book." "I finished the book this weekend! What a wonderful book you have written. It so tenderly explains what it is like to have a special child! It touched me in so many ways - more than you will ever know." "I'm an impatient reader if too many details are in a biography I will just skim. I didn't want to skim anything in your book." "Logically written. Easy to follow. Made me want to keep reading." "Should be required reading for all teachers and students." "I'm not a reader, but read your book. Couldn't put it down. Well written. Kept my attention." Thank you so much for giving of your time and coming to Dauphin Bible Camp to minister through speaking God's word to those here. Your hard work is noticed and greatly appreciated. You have such a kind heart and loving spirit. Thank you for not only investing in the lives of the campers but also taking time to invest in the lives of the staff. I am praying for you and hope that you have a wonderful week here at camp.